Clint Siddel | Doing It "The Little Way"
Last week I went to a conference on “Engaging Partnerships and Leveraging Opportunities” sponsored by the Rural Learning Network. The keynote speaker was Clinton Sidle, Director of the Roy H. Park Leadership Fellows Program at Cornell University’s Johnson Graduate School of Management and author of “The Leadership Wheel: Five Steps for Achieving Individual and Organizational Greatness” (Palgrave Macmillan, 2005). The topic was “Enlightened Leadership.” The presentation was so enlightening, I had to share! The Teacher knows the world, has Intellectual Intelligence, is an analyzer, and influences others based on their expertise and their intellectual grasp of their profession and industry. This leader is an expert as well as a coach and mentor. The Nurturer awakens the heart, has Emotional Intelligence, and is a “connector”. They recognize as well as manage the feelings and emotions of self and others. This leader is a servant and a people person. The Visionary sees the way, has Intuitive Intelligence, and is a planner. They see the big picture as well as think strategically and systematically in a way that helps others see opportunities and possibilities. This leader is a visionary. 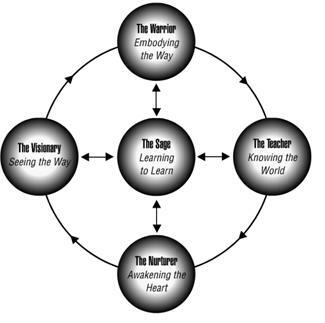 The Warrior embodies the way, has Action Intelligence, is results-oriented, and gets things done. They actualize plans; take control of situations; challenge processes; take risks; and experiment to make things happen. This leader leads by example. The Sage learns to learn; has Spiritual Intelligence; and knows themselves along with what they have to offer. They are learners, are open and candid, and strive to grow and develop. They empower to make a difference and make the most of all experiences. This leader is a learner. The goal of this “enlightened” process is to access one or more of these intelligences as needs dictate when leading others. The end result? Healthy relationships, teams, and organizations! For more information about this refreshing and enlightening, approach to leadership, go to www.clintsidle.org.